Television Forecast, later TV Forecast was a Chicago TV listings magazine that started in May 1948. It was in B&W with an additional colour on the cover. At the time there were 2 TV Stations in Chicago, and about 18,500 TV sets. There were only about 300,000 sets in the whole USA. It was started by Mr. Les Viahon and three of his WW II veteran friends. Each chipped in $250 and started publishing the magazine in the basement classroom of Abbot Hall on the Northwestern University Campus. They were so broke that they bound their first issue with staplers borrowed from the professors upstairs! They obtained (from a TV dealer's association or such) a mailing address list of everyone in the area who had purchased a TV set. For several months mailed the publication free, as a "programming service". This lasted until August 8th, when they began charging $3.00 per year (Charter members $2.00 per year). Prices for copies sold at newstands was 15c. The first issue distribution was 16,000 issues. As more people bought TVs the circulation went upwards into the tens to hundreds of thousands, but nearly all the copies were tossed out, once the next week's issue became available. A couple of competing mags were also launched at some point. The Detroit based TV Today lauanched a Chicago version of their magazine. Another called TV Times came out at first the same size and price as TV Forecast, but at some point it dropped the price to 10c and size to that of a pack of cigarettes with no articles just listings. By late 1952 the circulation of TV Forecast was almost 200,000. There were 4 TV stations in Chicago: WBKB 4 CBS, WNBQ 5 NBC, WENR 7 ABC & WGN 9 DuMont. 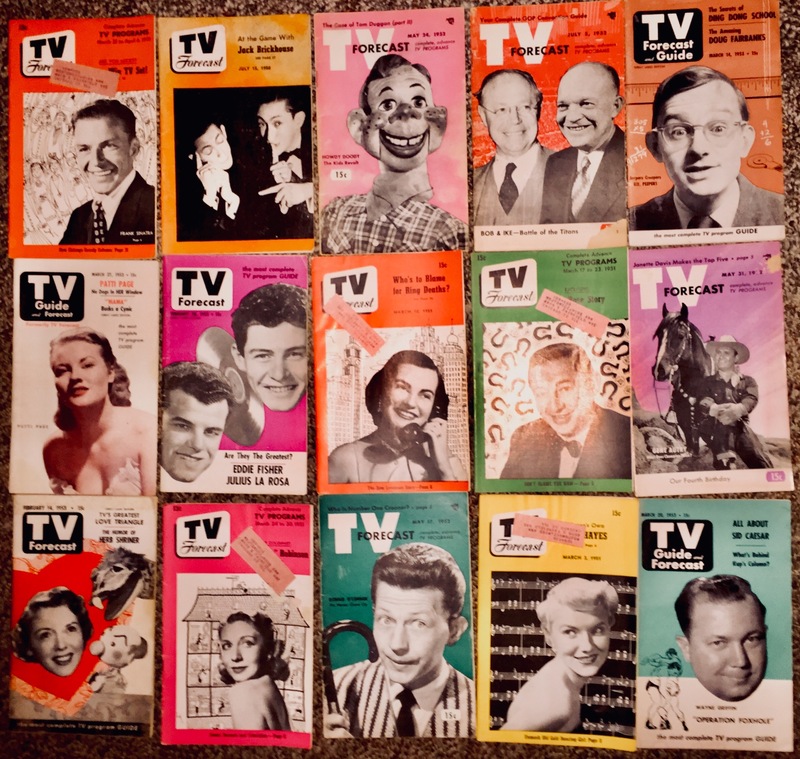 Walter Annenberg bought out TV Forecast (that by that time already had editions in Minneapolis and the Quad Cities) along with TV Guide ( a local New York City magzine, that also had editions for Washton DC / Baltimore and New England) and TV Digest a local Philadelphia magazine. In March on 1953 the last issue of all these publications came out. In April 1953, the first issue of the national magazine TV Guide came out. It had a cover and articles in colour and local listings in B&W. This would continue into the early part of the 21st century. Here is a list of all the issues of Television Forecast / TV Forecast, with the cover feature listed. If you have any that are marked PC or scan and want to get rid of them please contact.